Before Mia started kindergarten, I’d been in Wal-Mart once to get her a few pairs of stretch pants when the store had huge boxes of school supplies set up in the aisles. Parents wandered around with lists, muttering things like “erasers . . . erasers” with a kid dragging their feet behind them. I’d never had a lot of money to spend on clothes or supplies. I got the bare minimum, at the cheapest box store, and never anything that wasn’t on sale. Mia’s shoes were worn out by the second or third month of her running around in them, and they had to last the year. She always had the hand-me-downs or ten-dollar sneakers for gym class. I couldn’t afford to get her anything else. I planned us a special afternoon this year. She’d start a new school in a few days, and I wanted her to feel prepared and confident. Mia’s different from me. She cares about clothes and hair clips and matching bags and coats. It’d be good to spend a few hours doting on her. We live in a small town in western Montana, so it’s not like we have this huge mall to go to. But it has a good mix of people walking around, and that Monday before school started was especially crowded. I’d gotten there a bit before her hair appointment and looked at one of those maps for an ATM to give Mia some allowance money. I felt so dorky standing in front of that lighted sign. Girls in their early teens walked past, and I almost heard them thinking, “Who doesn’t know their way around the mall? It’s tiny.” But I had no reason to go there normally. We’d lived well under the poverty level for years and were far out of touch with what stores like Bed Bath & Beyond had to offer. My family lived in Anchorage, Alaska, during most of my childhood. It had a few malls that my mom dropped me off in front of so I could go spend my hard-earned babysitting money on earrings, sunglasses, and Orange Juliuses. There was a sort of culture to walking around the mall and being seen with your mother was mortifying. Unless she was one of those “cool” moms, which mine most certainly was not. Standing there in front of that sign, I got the sense I wasn’t either. We found the cash machine, then started meandering a bit, waiting for time to pass like the majority of the people walking around seemed to be doing. I stopped in front of a shoe store. Inside were racks of name-brand boots and sandals and walls of sneakers for every sort of activity. Five (five!) sales people stood, lined up, in front of the counter, waiting to pounce on anyone who felt tempted to look. I stood there for a little bit, considering Mia’s feet. She needed gym shoes. And shoes that weren’t a god-awful pair of shiny black pumps someone had given her that I waited for her to twist an ankle running in. Mia held my hand while we looked at the neatly lined racks inside, and I scanned the price tags hanging from the boxes, all of which seemed to be over fifty dollars. I must have said it a little loudly, because the woman walking in front of me turned around. Her eyes met mine. She had an amused smirk on her face and stifled a laugh. I watched as she leaned over to her equally blond daughter. They both had on nice jeans and carried large purses with designs and emblems on them. Their hair and makeup were smooth and perfect. The woman said something, and her daughter turned to look at me, and they both giggled. I was back to that dorky kid in middle school, shopping with my mom, only the mom was me. I pulled Mia’s hand towards the next shoe store I saw. I gulped in a bit of air when I saw the price tags. Mia sat down on a bench and a salesman walked up to us, asking what he could do to help. My kid’s face lit up and she smiled at me, then the salesman. She pointed at the table full of brightly-colored Skechers at fifty bucks a pop. I felt sweat gather in my armpits and on my temples. I could sort of afford it. I’d had some recent success in the last month and had sold a few articles for more money than I’d seen at one time in years. Mia had her feet measured and six boxes set out in front of her. 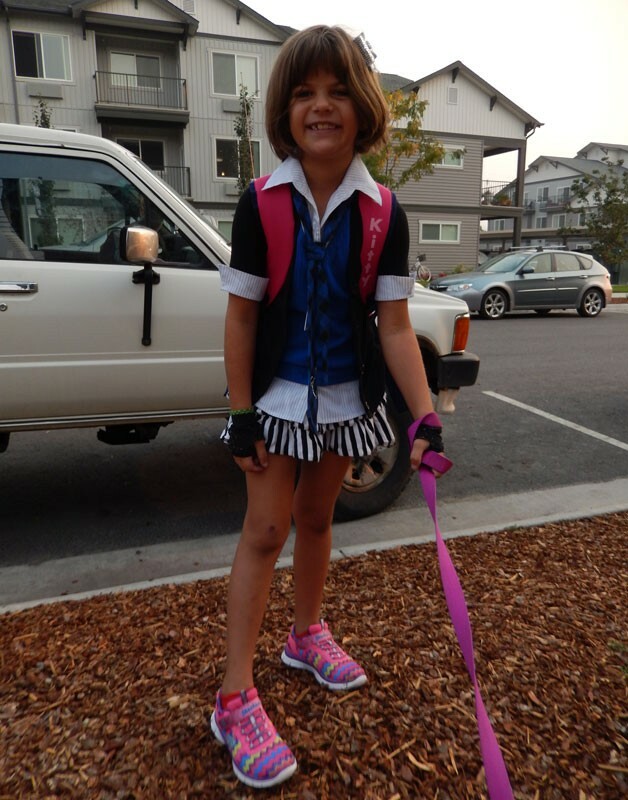 She chose the neon pink pair with Velcro and a colorfully lined gray pair with laces. I even agreed to the special water-proofing treatment. When the clerk said the total of $110.00, Mia looked up at me. “That’s a lot of money, Mom!” she said. I nodded, and smiled at her, and blushed a little. She wore the pink ones out of the store, carrying her own bag. Sure, I’d just dropped $100.00 before the haircut and the lunch. $100.00 I hadn’t even budgeted for, all because of a possible imaginary moment of humiliation. But seeing her dressed on her first day with those neon pink fancy tennis shoes on made it all worth it. I swear she walked with a little more bounce.